They let nothing stop them from going after what they want. Donald Trump started out with almost no support from the Republican party; it wasn’t until he kept leading in the polls that they saw no choice but to back him. Lord Voldemort grew up in an orphanage, ashamed of his family, but he still managed to become a great (evil) wizard. 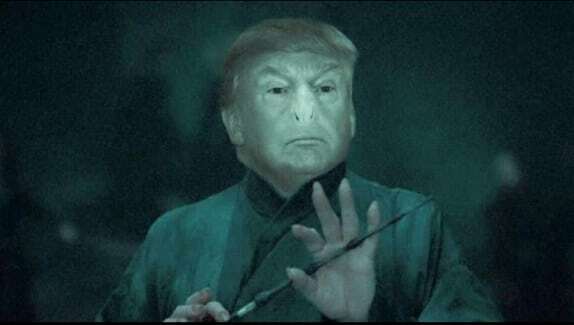 Trump would also belong in Slytherin. I don’t think this one needs to be explained. Lord Voldemort was able to split his soul with the help of Professor Slughorn, and then he gained and kept a loyal following, the Death Eaters, even after he was basically a shell of a human being. Trump has somehow managed to stay relevant in the media and in this election, despite his controversial comments. I think he has some of our country fooled into thinking he’s a good candidate just because he can talk and act confident. They scare some of us, and the rest they bring out the worst. I don’t think Trump is causing all of the racist, misogynistic, xenophobic behavior of some of his followers, but he is definitely exploiting it. I’m sure some of Lord Voldemort’s followers would’ve been horrible people, but not all would’ve turned into murderous Death Eaters. They like to destroy people who are against them. Even before this election, “the Donald” used Twitter as his weapon of choice to attack people for no legitimate reason. He did this with Rosie O’Donnell, Cher, Russel Brand, and Mac Miller; and now he’s doing it to that “nasty woman” Hillary Clinton. Lord Voldemort killed, or tried to kill, basically everyone who was in his way or did not follow him. The amount of hyperboles Trump uses when he talks is so very very like the worst thing in history annoying. He uses fearmongering to stop us from wanting to allow Syrian refugees into our country, reminiscent me of how Lord Voldemort does everything in his power to scare the living s**t out of everyone, to make them thing muggles are dangerous. He finds it amusing, and like Donald, a way to gain more power. To be clear, I do not think Donald trump is as bad as Lord Voldemort, but the fact that they share so many similarities is terrifying! Based on his speeches and debates, I believe Donald Trump has the same mindset as Voldemort, from the quote above. He discounts the horrible things he has said or done by talking about “bigger” issues like immigration or ISIS: He is not good or evil, but he wants this power.